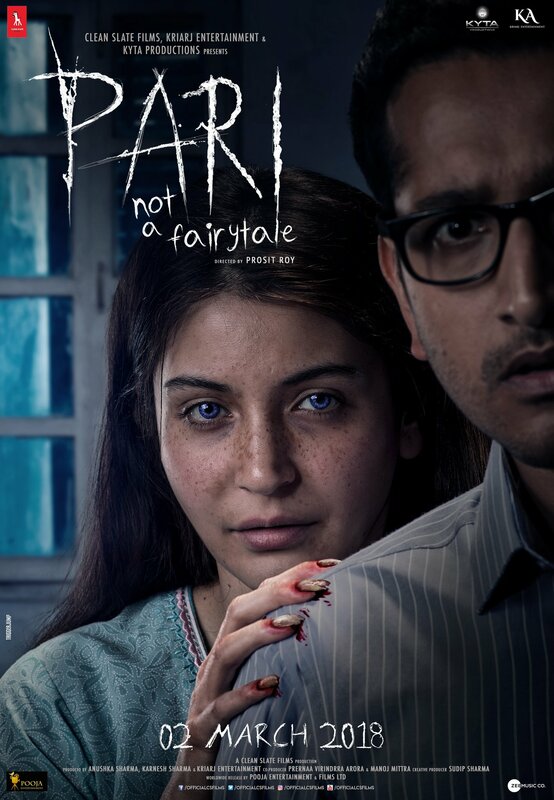 There is a heartstopping moment of elemental candour in this chilling portrayal of love amidst horror, where Anushka Sharma, in what easily ranks as her best performance to date, is seen scavenging food from a dustbin. The irony of the situation, suffused as it is in a surfeit of ominous forebodings, is that she is ferreting for discarded food in a kitchen with a refrigerator filled with food. The moment to me, defined the cultural and spiritual crisis that debutant Prosit Roy captures as he creates layer after layer of terrifying incredulity and crisis in a narrative spiral that finally comes together in a gasping startling rush of sanguinary salvation. Pari is not an easy film to watch. While it duly declares that no animal was harmed during shooting animals, including a pet dog and a parrot come to horribly harmful deaths in a plot that impales its characters to Satanism and challenges all the traditional tropes of the horror genre. There are no creaking doors and shrieking banshees in Pari. The atmosphere is deceptively placid. Director Prosit Roy and his estimable cinematographer Jishnu Bhattcharjee shoot the macabre proceedings in the fading light of a terrifying twilight. Seldom have I seen a film’s look and appearance being so commensurate with it’s mood, theme and treatment. This is not the Kolkata of Durga pujas and Howrah Bridge. Not even the bright tram-travel romantic city of Onir’s Kuch Bheege Alfaaz. Not a glimpse of the iconic landmarks of the city in Pari as it negotiates through dimly-lit lanes with barking dogs and snarling miscreants. Specially portentous is a chase sequence where the hero is followed by a seedy morgue assistant, played with heaving brilliance by Dibyendu Chattacharya. The background score (Ketan Sodha) too is minimal, interjecting intimacy and warmth into the gulps of grotesquerie that grips the characters. The narrative never hesitates in pulling back from its horror to give the central love story room to breathe, and breed. Breeding, let me tell you, is central to the plot. The complex ritualism inherent in the dark omnipotent plot goes all out to claim its victims. But what I came away with was a tender love story of a homeless childlike psychologically traumatized woman and a kind gentle man who provides her a home. Yes, this the Sadma territory with Anushka Sharma and Parambrata Chattopadhyay using the measured spaces of a typical Bengali home (no fish curry smell wafting from the kitchen, though) to build a relationship between the homeless waylaid girl-child a man so kind he makes Kamal Haasan in Sadma look a wee wily. Parambrata’s unnerving empathy just flows out of the actor making his character Arnab quite a contrast to his namesake in the media world. For Anushka Sharma, this is the career-defying role that she can brag about to her children. She sinks her soul into her traumatized role with a sighing innocence. Her Rukhsana bleeds and bleeds not just from the nose, lips and eyes. The wounds run deep. This is a severely traumatized woman battling the sinner within that challenges the angel that she could have been if fate hadn’t willed a satanic karma for her. In many sequences, Anushka undergoes severe physical humiliation and trauma. She rises to the occasion, sometimes literally as her Rukshana climbs building sides like a ghetto Catwoman. There are sequences of satanic rituals including glimpses of enchained women with their foetus being aborted that could easily have seemed gratuitous and repulsive. Throughout the upheavals, director Prosit Roy maintains a high level of vigilance over the proceedings. He directs his actors with a keen sense of compassion and tension. But he knows where to let go. The narrative strains on the leash like a hound that won’t stop until it bites. The impact is strong and yet moving. Anushka’s imploring eyes beseeching us to understand that those who are pulled into diabolism are often victims of circumstances beyond their control, will stay with us forever. So is this the finest supernatural thriller in living memory. Heck, yes! Don’t waste your time watching the other films this week. Pari is a film to see and not only for horror buffs. The real horror that this film explores is the exploitation of the weak by those who take on themselves the task of “protecting” the moral values of a decadent story. Rajat Kapoor as a one-eyed exorcist is chilling in his normalcy. When he perishes his false eye does a little dance of death on the floor. Like a child that will have its way even if the mother must be mortified in the process. And yes, we will never inhale the scent of an agarbatti in the same away again. 15 queries in 0.473 seconds.